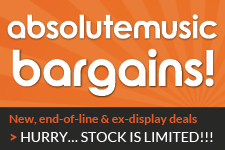 At Absolute Music we stock a huge range of the best USB Audio Interfaces for music production from top USB interface brands including Focusrite, Audient, M-Audio and Presonus. We have a whole team of computer recording experts in-house who will be more than happy to discuss your audio interface requirements. These interfaces vary in size and functionality depending on your requirements, for example various numbers of inputs/outputs, built-in preamps, monitoring flexability etc. We also have a number of interface bundles that can really get you up and running with a microphone and other recording accessories. As with all of our products, our USB Audio Interfaces are available to buy online or from our music superstore in Poole, Dorset. Order your audio interface online before 4pm to receive next day UK delivery. Between now and January 31, 2018, Steinberg are offering UR users three free VST Sound Loop Sets. Arturia just launched their first professional USB recording interface, and they didn’t do it by half-measures. The second generation Scarlett range is packed full of upgrades. New super-low latency brings confidence to your performance, letting you record and monitor with software effects in real time. M-Audio, synonymous with innovative music production technology, today announced the introduction of their latest versions of their renowned M- Track audio recording/monitoring interfaces.